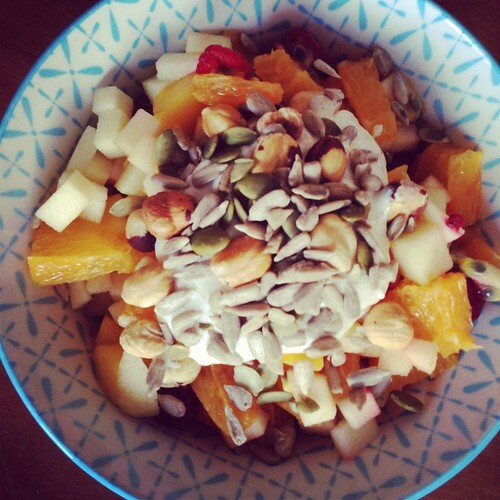 A big bowl of fruit - an apple, an orange, two passion fruits, a little mango and raspberries. I topped it with some greek yogurt, slightly sweetened and spiced with cardamom, and then some toasted hazelnuts, sunflower seeds and pumpkin seeds. Loved ur blog.. though there are many recipes which i can not make because of egg as m pure non-vegetarian but even then i shall try them for sure after finding sum substitutes for eggs.